Is this still BCC Automotive? As always, you will find our same excellent automotive repair service and you can count on rates that are below those of dealerships. For those who know us, we know that you won't like surprises any more than we do. We will always check with you and lay out the options before doing any work outside of your original instructions. I have been taking my BMW 525i to Mike at BCC Auto for 2 years, and it has been a wonderful experience all the way around. Mike is knowledgeable, friendly, and takes the time to explain problems to me in English. I love my car very much and I would never take her anywhere else. 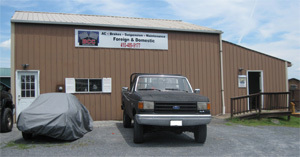 The team at BCC Automotive, Inc. has a wide range of experience repairing and maintaining foreign and domestic cars. Beyond the expert level of our work, we pride ourselves in being easy to work with. Call us the next time you need a regular maintenance visit and join our long list of happy customers. Their cars may change over the years, but we keep on working on the ride. Our business has been in family hands for quite a while. 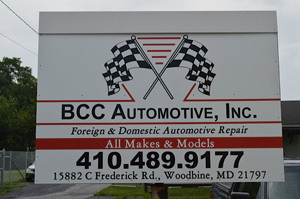 Our original expertise was the foreign import car our name used to be "BCC Auto Import". We now work on almost all foreign and domestic vehicles while still maintaining our practice of high performance vehicle repair. We would be very happy to provide you with a free estimate on all body work and auto painting. Whether you have your car in the shop with us and need an estimate or if you would like to bring it by BCC Automotive for that purpose alone, we would be very happy to work up an estimate. Let us take care of your dents and dings. We are convenient to Northern Virginia, NW Washington, DC, and the suburbs around Bethesda, including Kensington, Potomac, Rockville and Silver Spring. Like all other estimates, we recommend that you call first or email and let us know that you are coming so that we can give your car the attention that it needs. Whenever possible, we make appointments in advance so that we can have your car on our schedule. You may wish to call us at 410-489-9177 or use our contact form and we will arrange for the best possible available appointment to work on your car. If you have any questions or would like to schedule an appointment, please call us at 410-489-9177 or use our contact form.